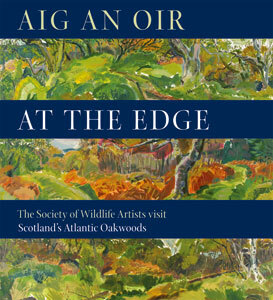 The Aig An Oir project is a collaboration between the Society of Wildlife Artists, Forest Enterprise Scotland and Hi-Arts. This is a celebration of the magical but little-known Atlantic Oakwoods of the west coast of Scotland. Robert Burton’s informative and easy-going text describes some of the restoration work being carried out in the Oakwoods. Lying not just on the edge of Scotland but at the very edge of Europe, these lush, temperate rainforests are an internationally important habitat for plants and wildlife. a magnificent, sometimes surrealistic collection of work that is enormously varied, not only in terms of media used (watercolours, oils, aquatints, pastels, acrylics, etc.) but also of subjects (scenes, plants, animals and insects)…….. These woods, a scarce habitat in Europe, are nationally important sites for rare lichens, butterflies and much else besides. Aig an Oir highlights their conservation and cultural value and succeeds admirably in conveying their atmosphere, wealth of life and beauty. If I hadn’t received a review copy of this book celebrating Scotland’s Atlantic forests, I would definitely put it top of my list and can recommend it heartily to all who enjoy wildlife art. The book is a magnificently successful end product of a collaboration between the Society of Wildlife Artists, local artists, Forestry Commission Scotland and HI-Arts…. The books appeal is very broad…..I’ve always believed a good designer is one who doesn’t draw attention to his or her efforts, but merely serves the best interests of the project. In this respect Nye Hughes deserves the highest accolade, as text and images are married elegantly together and a great deal of care has obviously gone into the selection of illustrations on every spread……The publisher Ian Langford is now setting the standard for the production of wildlife art books of the highest standard and at affordable prices. The SWLA artists’ work collected in this lovely book capture the beauty and wildlife value of this unique habitat…. For someone who normally runs a mile on hearing the words ‘wildlife art’ I was enchanted. There are many stunning pictures to enjoy….Like the other books in this series Aig An oir celebrates both habitat and its management.